Tonight, 20 drivers compete for bragging rights and a virtual checkered flag at Martinsville Speedway on the iRacing.com simulation for the eNASCAR Gander Outdoors 100 iRacing Pro Invitational (3/19, 9 p.m. ET, eNASCAR.com). JR Motorsports racer Noah Gragson returns to the site of his first Gander Outdoors Truck Series victory. Keep an eye on this Xfinity Series rookie. Gander Outdoors Truck Series managing director may have hung up the helmet for his race truck, but that doesn’t apply to the virtual world, right? Xfinity Series racer Chase Briscoe is known for his versatility, winning some of the most unique and challenging races on the NASCAR circuit — and beyond. His 4496 iRating proves he’s just as good even when he’s not strapped into metal and rubber. JHN’s last Gander Outdoors Truck Series victory came at Martinsville. Can he follow it up with a win in iRacing? NASCAR Xfinity Series rookie and Gander Outdoors Truck Series Championship 4 driver Justin Haley has made six starts in actual trucks at Martinsville, and improved his finishing position each time. Could that mean a win is in the cards in the Pro Invitational? On paper, Gander Outdoors Truck Series racer Todd Gilliland may not have the highest iRating in the field of pros, but it’s just a number — and no representation of his speed and skill on short tracks. With a nearly 4000 iRating, the “Number Nothin'” Xfinity Series racer knows how to get it done in iRacing as well as behind the wheel of real race cars on weekends. Toyota development driver has impressed in every level of racing — and even though he’s new to the Gander Outdoors Truck Series, he’s no stranger to going fast on iRacing. Two-time Gander Outdoors Truck Series race winner Parker Kligerman is a believer in iRacing, co-owning an eNASCAR PEAK Antifreeze iRacing Series team with Jeff Burton. PK’s in the elite over-4000 iRating club, so this early iRacing adopter knows how to win. 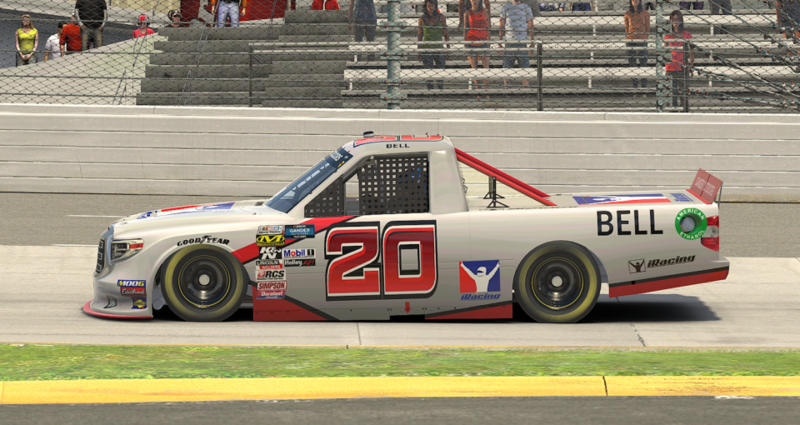 Hattori Racing’s newest winner in the Gander Outdoors Truck Series looks to continue his success in the virtual world. Will Rodgers is fast in just about everything, including in iRacing, where he holds a 3191 oval iRating. NASCAR K&N Pro Series star Derek Kraus boasts the fourth-highest iRating scores in the field at 3015. Look for his truck up front. Tyler Ankrum is rising through the NASCAR ranks — in fact, Martinsville was the site of his Gander Outdoors Truck Series debut in 2018. Gander Outdoors Truck Series regular (and hot sauce peddler) Myatt Snider scored a podium finish at Martinsville. His 1947 iRating shows he’s no iRacing rookie. Ryan Vargas goes by “The Rhino”, and you certainly need horns at Martinsville Speedway. The NASCAR Next driver holds an 1825 iRating. Max McLaughlin is tearing up the field in the NASCAR K&N Pro Series. His 1331 iRating isn’t the highest in the field, but he knows how to get around a short track. Gander Outdoors Truck Series newcomer Anthony Alfredo is no stranger to short track racing, and tonight he’ll prove he can get the job done in the virtual world, too. This Kyle Busch Motorsports development driver from Canada makes his Gander Outdoors Truck Series debut at Martinsville Speedway next weekend. With a 3510 iRating, he could certainly contend in the Pro Invitational. Sure, Chicago Bears guard is the only non-pro racer in the field, but he knows a thing or two about iRacing. Perhaps his Mode Motorsports eNASCAR PEAK Antifreeze iRacing Series drivers Cody Byus and Phil Diaz can give him a pointer or two before the green flag drops.